Let’s start ath the very beginning, a very good place to start! But it’s clear by now we’re going to get surprises, and some of them might leave a bitter aftertaste. A LOT will depend on staging, vocals and camera work. Definitely the most unpredictable semi in years. – Yes, that’s seven consecutive entries for ya, living on the edge! I could see Russia as a NQ for the first time, but they have strong allies in this semi. And I’m still tempted to chuck Georgia out, simply for going too far out of the box, and keeping Hungary in. Now for the million dollar question: who’ll win the bloody thing? Obvious answer: haven’t got a freakin’ clue. Let’s go for a segmented approach then! Israel: Objectively it stands a very good chance. It’s contemporary in every department and Netta charms everyone’s socks off. I still don’t feel it myself, much like Italy last year. Czechia: Mikolas sure knows how to sell it, but a very accessible song it ain’t – except fort he saxophone bit (again, hi Moldova 2017). It used to be a contender in my mind, until Israel and Norway came along. Israel will outhype it, and Norway will eat away points from it. I don’t think this is Czechia’s year, but well done to them for finally entering the circle of contenders. Estonia: The most difficult one to guestimate. 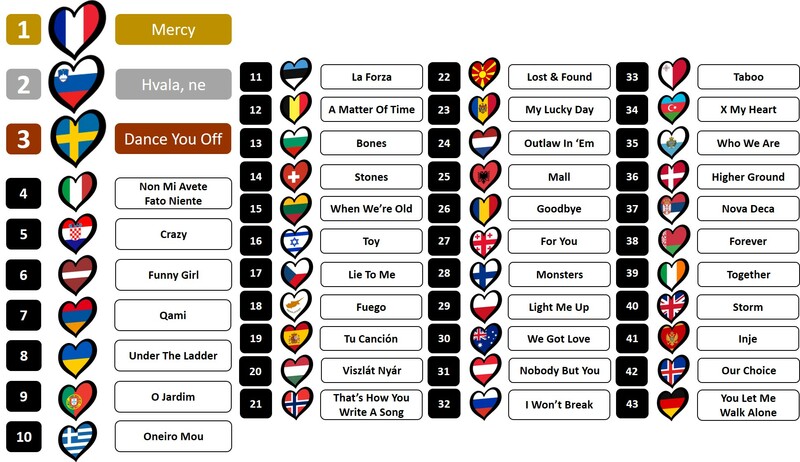 It’s hugely popular and equally polarizing, and almost no operatic-ish entry (bar Italy 2015) has really shone at Eurovision. But Elina’s a star, so who knows. Bulgaria: It might score a high top ten position, but do you really see this take the crown? I sure don’t. A lot of blowing, but not enough puff. Australia: No idea how they ended up in the bookies top 5. Are they serious? France: As previously stated I might be blinded by my unconditional love for it, but I still have a got feeling that this is going to do VERY well. Sweden: it’s near invisible in every poll I encounter, but that brilliant stage show is a force to be reckoned with and will push this a very long way. Norway: Much like Sweden it’s nowhere in the polls, and much like Sweden it’s the live rendition that’ll give it that certain je-ne-sais-quoi. Do not underestimate the Power of the Rybak. Unless Czechia can stop him. Greece: Ever since it was released I’ve considered it to be dangerous and I stand by that gut feeling. If they get everything right, this could be the surprise winner à la Azerbaijan 2011. Spain: I wanted to include a real surprise winner and Spain was the first to come to mind. I know, weird. Portugal was a close second though. They’re both songs that might manage to strike the right chord. I’m opting for Spain because its stage show will certainly get people talking and as we say in the world of communications & marketing: no such thing as bad publicity. Am I right, Russia? And now it’s up to you – who do you think will win ESC 2018? Thanks for reading and voting, and have a happy Eurovision! Watch this spot for some updates during Eurovision week! On both semis you predict 6 from first half and 4 from second half to qualify.